A loan of $700 helped to buy chargers, mobile phones, memory cards, phone screens, phone speakers and phone batteries. This is 41-year-old Alimamy. He is married and has 2 children aged 6 and 2 years. One child attends school. In 2011, Alimamy established his mobile phone and accessories business. 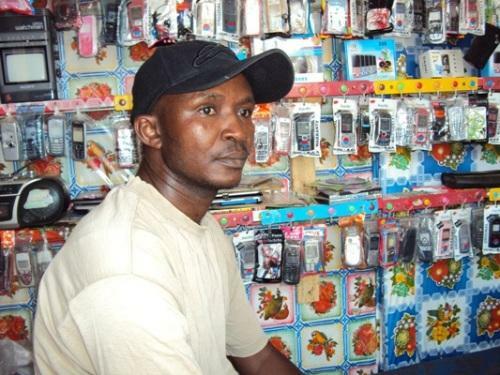 He began his business because he dropped out of school (due to lack of sponsorship). He joined his brother's business, who supplied him with patent medicines to be sold and paid back at a particular cost. He was in the patent medicine business for some years and the commission he earned were used to start his own business. Working 7 days a week and 15 hours a day, he earns about 1,900,000 SLL every month from this business. He would like a loan in the amount of 3,000,000 SLL. Alimamy requires a loan to buy chargers, mobile phones, memory cards, phone screens, phone speakers and phone batteries. Alimamy was not able to build a house or shop but he does improve his stock to meet demands. This loan will help him to buy more stock and maximize profits. He is an honest and trustworthy business man. He thanks you and ARD for supporting his business.